Archives : FM MOUTHSHUT.COM - 10/07/2009. FM @ MOUTHSHUT.COM - 10/07/2009. The Indian markets were highly excited about the budget and expected it to be a path-breaking one, but to their shock and dismay it turned out be one of the most unclear and pedestrian budget seen in the last many years. It was thanks to our new FM Mr. Pranab Mukherjee, who can be better described as a FM with good PR skills but lacking in market sense as compared to the previous FM Mr. P. Chidambaram who was extremely market savvy. The thumping victory of the Congress in the elections made the market excited and the market rightly hoped for a reform oriented budget, but what it received was damp squib. The new FM had everything to gain as he only had to give clear signals about disinvestment and decontrol, but he dished out a non-transparent and a budget fit for the eighties. The market gave a thumb down to our new FM @ mouthshut.com. SENSEX TO FILL THE GAP. In the last article we had clearly written that if the budget is not as per market expectations then the market will move down and fill the gap between 13479-12256 on the Sensex. The market expected a ‘Big B’, but it received a ‘Dumb B’, thanks to the FM. The market has confirmed an intermediate top at 15600 for Sensex and 4693 for Nifty. The market is in a mood to correct as it started ignoring good news. The inflation figure, once again came in negative and lower than expected, but still the market chose to ignore and continued to correct. The IIP nos. came in much better at 2.7% v/s 1.4%, but the market ignored it and continued to correct. The Infosys results were much above expectation but the guidance slightly week. The Infy stock went up, but the market continued to correct. The market has made up its mind to go down and so no amount of good news will help the market. Sensex opened the week at 14962, made a high of 15097, made a low of 13418, and closed at 13504, thus registering a weekly loss of 1409 points. Sensex has formed a Big Body Bearish Candle on the weekly charts which is completely engulfing previous week’s small white body. Infact if we consider the last 4 week’s candle formation it is forming a Bearish continuation pattern called ‘Matt Hold’. 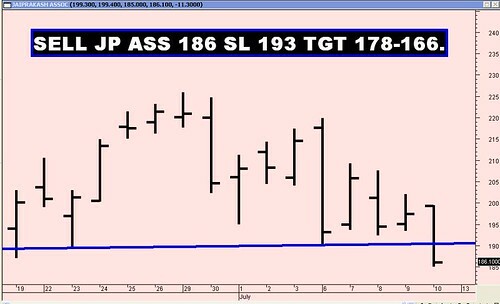 Sensex has given a close below the 50 DMA (13992) and hence the short term and medium term trend have turned down. On the weekly charts the Sensex has broken the 100 Week M.A. (14235) and closed below it. The 200 Week M.A. (13050) will now be tested. The Sensex has formed a Bearish Reversal pattern called Head and Shoulder and the target for which are 13170-12169. Because of the downward momentum the Sensex is likely to fill the gap between 13479-12256. The Sensex is now correcting the entire rise from 8047-15600 and the correction levels are 12715-11823-10932. The indicators are showing continued weakness. The momentum indicators ROC &RSI have given a sell signal on Monday itself. The MACD continues with the sell signal and is now moving into negative territory. The Trendline resistance for Sensex is at 14354. For the week ahead the Resistance is at 13727-14016-14526. Support is at 13170-12558-12169. Nifty opened the week at 4429, made a high of 4479, low of 3976, and closed at 4003. Thus the weekly loss was 421 points. Nifty has formed a Big Body Bearish Candle on the weekly charts which is completely engulfing previous week’s small white body. Infact if we consider the last 4 week’s candle formation it is forming a Bearish continuation pattern called ‘Matt Hold’. Nifty has given a close below the 50 DMA (4208) and hence the short term and medium term trend have turned down. On the weekly charts the Nifty has broken the 100 Week M.A. (4266) and closed below it. The 200 Week M.A. (3877) will now be tested. 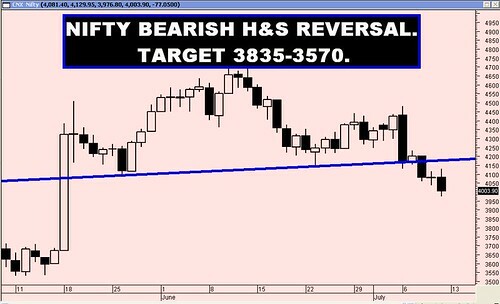 The Nifty has formed a Bearish Reversal pattern called Head and Shoulder and the target for which are 3835-3570. The Nifty is now correcting the entire rise from 2539-4693 and the correction levels are 3870-3616-3362. The O.I.PCR is at 0.84 and is close to the oversold level. 4100 strike is seeing lot of CALL writing and hence is expected a strong resistance. 3800 strike is seeing PUT writing and is expected to act as immediate support. The Trendline resistance for Nifty is at 4179-4230. For the week ahead, the Resistance is at 4092-4143-4361. Support is at 3877-3790-3657. Construct a Bear Spread for Nifty. Buy 4000 PE at Rs.130 and sell 3800 PE at Rs.65. The cost of constructing the spread is Rs. 65 (Rs. 3,250) which is also the maximum loss and maximum profit will be Rs. 135 (Rs.6,750).